November, 1909....They were totally unaware until the visitors drove up. The fine large room recently erected for the men’s quarters during shearing time was invaded, bunks removed and soon everything was ready for the dance. The genial host and hostess and family joined heartily in the fun, as did also the shearers, and a warm welcome was received by all. At midnight, refreshments were handed around, which were provided by the visitors, after which the fun was resumed and kept going to daylight. Refreshments were again partaken of, after which a start was made for home, one all having thoroughly enjoyed the night’s fun. This excerpt came from a newspaper article about a party held at my relatives farm in 1909. They were probably sitting around the fire with their seven children when they were surprised by lots of people who had driven for miles, just to have a surprise party. Imagine. These days the past holds as much fascination for me as the future. I’ve noticed my eyes no longer glaze over when my mother talks about the family tree. Yesterday, I immersed myself in her book which holds the lives of families past. There was the Polish Countess who had to escape when Russia invaded and her relatives who had to do the same when Germany attacked. Then there was the English convict banished to Australia for stealing a handkerchief. And some interesting skeletons like the Norwegian ship Captain, a Polish mother and an 8 month voyage. My father has a Polish and German background. He is blue eyed and fair. Names like Ferdinand, Frederick, Karl and Johann abound. My mother has a British and Australian background. She is olive skinned and dark. Both lineages entwined with Jewish, Catholic, and Church of England beliefs which wax and wane with each passing generation. Mix all that together and you get me. A fair haired, pale skinned, green eyed Australian with my mother's Jewish nose and a feeling that I have strong roots in Italy for some peculiar reason. Go figure. My world is indeed a melting pot. And the generation which follows will spice it up some more with Asian and Pacific influences. While I was leafing through the past, something struck me. Despite all the advances made in the last century, are we having as much fun as they appeared to in past generations? Are we in fact far more isolated in our hi tech industrialised cities than our ancestors who lived in isolated and sparsely populated parts of the country? Maybe they had less of everything and life was harder but maybe they had more of what counts. Close friends, family, neighbours, a strong sense of community and some amazing all night parties. They say you have to take the good from the past, learn the lessons and forget the rest. I think I found 'the good' today. I want to party like they did in 1909. When was the last time you partied till dawn? King Edward VII was on the throne. Construction began on the Titanic. Joan of Arc was declared a saint. London's Victoria and Albert museum was opened. The world's first air race was held. The actor Errol Flynn was born. It was interesting to read about your genealogy ! Perhaps Des is descended from Frederick the Great and has a claim to fame ! The lack of security must have been stressful too. People could be sacked on the spot for a minor misdemeanor or even at the whim of the boss.Not much financial help was available so homes could go and families could be split- although there was often a wonderful community spirit and people helped each other in every way they could. That seems to have waned a bit now but then no one is faced with such desperate circumstances. I'm glad i've lived in this age. Life has been good I have been very fortunate-doubly so- two new houses. two children,two computers, two good men and wonderful freedom and financial independence to travel ,indulge my loved ones and my many hobbies. Absolutely fascinating! You're so fortunate to have so much information to enjoy regarding your past. This is so cool you know about all of this! I wish I knew more of my geneaology! Love that your family lineage is written down. Mine is diverse, but so many stories didn't make the oral tradition of being passed down and nothing is written. Someday I hope to have the time to research it. But my heritage is English, Irish, Scottish,, German, and Native American. My husband is Chinese, Hawaiian, Filipino, Spanish, and Portuguese. My kids don't even bother saying them all. "Despite all the advances made in the last century, are we having as much fun as past generations? Are we in fact far more isolated in our hi tech world and have we severed our community ties forever? You belong in Hawaii, Lilly where we have so many people of different ancestries mixing together to be a rainbow population. Over here, people will proudly say they are Irish, Japanese, Korean, Portuguese, Filipino and a bit of this and a bit of that. I love it! People also like to party over here. But until dawn... maybe when I was 19. And yes, I think "fun" per se, has become standardised and globalized , thanks to technology. The individuality is lost. Our parents generation knew how to make folks laugh, and how to laugh with them, regardless of age. We have learned to compartmentalize things. P. S. And Lilly, you know India comes before Pakistan when you travel from Australia to Italy. A better stopover ? I remember reading a sci-fi short story (forgive me if you've read it) in which a man took the wrong turning in the railway passages and ended up on a platform he didn't recognise...except that it was from the turn of the century. He spent some time there and found that he enjoyed life so much that he eventually sold up everything, bought old currency notes and went back to the platform for the last time...to take a train....but not before telling his friend that he would post a classified ad in the local paper around 1901. After he had gone, his friend went to the local library and found the back-copy of the newspaper and there, sure enough was the message to him. "My dear friend, it has now been a year since I left your time and I have no regrets, other than not seeing you again. At the moment I am sitting on my front porch. The evening is warm and the flowers smell so sweet. In around an hour, the Simsons and Ralph are coming around to visit and we are having home-made cream soda, after our meal...."
The last overnight party I had was last year at Stonehenge for the Summer Solstice...It was wild. Lilly, this post is not just about the past but also about diversity. I believe our community, our world, gets strength from diversity. Yet there are people who fear it. Many of my past all-nighters were work related. Actually a late night of sharing stories with friends and family can be better than a party (no hangover). Have a Wonderful Day, Lilly! Oh! I've never partied like that... but gosh.. how I wish I knew more about my genealogy! It's wonderful your mother has a book with your family history recorded. I find with all the technology of today we spend less and less time talking to our elders to get the "family facts" in writing so much is lost forever. One of the things I love about the past is that they seemed to be so good at recording events with photographs. With all our digital cameras I can't remember the last time I took a huge group family photograph like the one in your post. Thanks for a terrific post and a look into your family history. What a lovely reminiscent post, and great comments too. My mother-in- law just told us that my husband's grandfather was firmly plucked out of the casino by a strong wife who then proceeded to buy property and run a profitable farm. We all thought it was the grandfather's effort. Guess he was a party person. Fabulous history and lovely story! Many of us colonials are fortunate to share a very rich history! Fantastic, Lilly! A wonderful story. I have a fairly colorful background, too, although most of it came as result of the famine in Ireland when many relatives came to the states, there's some American Indian, and heaven only knows what else -- whatever, I'm a mixture to be sure, and then of course, there are my kids with their black heritage as well. But I'm ready to party whenever! Been a long time since I did an all nighter, but I'm always game! Enjoy the rest of your weekend! Lilly your posts have been so interesting lately. I am an amateur genealogist, and to see the complicated web of people moving from Old World to New to funnel down down through the generations to make little old me is a thing of beauty with a few holes that frustrate me no end. I have to agree with several others who commented: The last time I remember partying all night was prom night 1974. And they locked us in the gym and showed us Cool Hand Luke. Your ancestors really knew how to party. Crikey mate. I'll sit here, on my electric blanket, sipping my cappuccino, and think about it a bit. My eyes no longer glaze over when the older members of my family talk about the family tree. In fact I encourage them and tape their conversations as I am now in charge of updating and delving deeper into our family ancestry. You have a fascinating background Lilly, I guess that is why you are so fascinating and talented. You have asked some really important questions to which I don't have any answers ie "Are we having as much fun as past generations? Are we in fact far more isolated in our hi tech world and have we severed our community ties forever"? I am hoping the answers are Yes, No, No. but like you I am going to take the good from the past and continue along my journey. The last time I partied till dawn was this year after the Jackson Browne concert in the Hunter Valley winery....we kept on singing "On won't you stay just a little bit longer"....great memories...wish you were there! After our email conversation yesterday you inspired me to do another blog post. Take care dear friend and I am pleased the sun is shining in Canberra and Sydney. Thank you so much everyone for your great posts. We learn so much from each other. One thing is clear. We are not party animals in this group. Except Peggy at her Jackson Browne concert perhaps - and yes I would have liked to go along to that. And Barbara has a life that does seem just as wonderful as she describes here - she is a total joy and a funny blogger. I partied all night last weekend and am still recovering. Maybe they didn't drink in 1909 did they? Otherwise, how could they get up to milk the cows or tend the fields or look after hundreds of children. I would love to do what Henry spoke about - go back in time and just watch what went on. How interesting it would be. Look at that photo in all that reglaia in the hot hot sun too. I loved this blog post. My father gave me some of his family things awhile back - a family tree book - and his diary that he kept when he was 20 and in Vietnam. I have many memory keepsakes from my grandmother as well. Girl, you can come knocking on my door but unfortunately, the dogs may bark but I'll be snoring! LOL No partying here past 10. I'm fast asleep at that time! You do have interesting relatives. A real mixture of the good the bad and maybe the ugly too, makes a fine melting pot. I can't recall ever partying til dawn, but would give it a go should you ever pop. over! I have taken thousands of party folk home around dawn in the taxi on a Saturday night and basically they are almost out for the count by then! Part of the ugly brigade really. Hic! Lasht nite - hic! And you're my bestish pal in the whole wide world...hic! I do think they had 'more of what counts'. I have photographs of wonderful picnics and tennis parties of my Mum and Dad's courting days. They had an absolute ball. As I grew up we still always had picnics and parties, and tennis matches in the family routine. There was hard work and plenty of it. But they still had time for their families. Not like today! Another non-party animal here, but what a wonderful post, Lilly! Your ancestry is fascinating and I love the photos too. Thanks for the smile about 'not glazing over' when your mum shares family history. Cheers and here's to our families past and present (and future). Banished for stealing a hankie?! I agree - just look at the developing countries that have less wealth but share so much more and are richer in other ways. I think our hi-tech cities are very isolating. Partied till dawn? Well, you're talking to a gal who is asleep by nine! I did, however, party till midnight once in April and again in June as I'm involved in organizing Sweden's TEDx Stockholm events. Now that's a surprise party! I wish our newspapers carried that kind of news! Maybe that's why they're dying and being replace with blogs like yours. Thank you. Great post Lilly - I have not partied till dawn since before I was married. I will say that we have always tried to get together with friends alot but you are right. The old days they had a much better sense of community. These days you can get through a week without actually speaking to anyone if you didn't want to - with e-mail and texting. So sad. P.S. I loved Italy - really LOVED it but I would also love to visit your part of the world someday! Have you been to the US? I really do think that in a lot of ways we've swapped connection with people, nature, life for a connection with technology, material possessions and money. Having said that, I also think we are starting to shift back. People seem to be downsizing and getting back to basics (the global financial crisis is probably a major catalyst for it). I hope we take the good from the present and the past and create an even better future! Geez, I can't remember the last time I partied all night. Does 1am a couple of weeks ago count? Thanks for your comments everyone! We all seem to like our sleep it seems. No-one has had an all nighter of recent times except Ms Peggy. 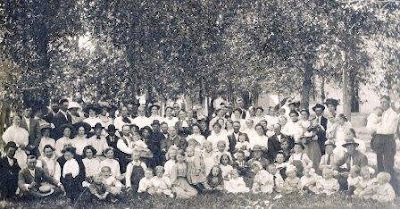 I love linage stuff, the more I learn about my family the more I want to know, you are right it is very interesting to learn about our past family and all we can hope for is that our kin in the future find us as fascinating. Great post Lily. Very fascinating. Looks like we are all as adventurous as each other, like not. Seems we like staying home as opposed staying out all night. Last time I did was at my brother's bucks night and then his wedding. That was a year ago. You can knock on my door any time. oh, and I love how you worded it. "less of everything but more of what counts"... really strikes a chord with me. thanks! Lilly, the last time I partied till dawn was in another lifetime. I don't think I'll be partying till dawn again in this lifetime, either. Do I miss it? - not a chance. When my son and his mate went out the other night, I chuckled at their 'it's f--f-frrr-eeee-zz-ing' comment as they headed out into the cold, and felt glad those days are oh-ver for me. I don't mind a bit of a late night here and there in summer, but midnight is now pumpkin hour for me at the best of times. @ Rowe - imagine you with a son that old! Pumpkin hour - seems we are all the same. My daughter has let the charge to record our family history and she's organized photos on ancestry.com. We are Black Americans and she's actually traced our family back on her father's side to a slave plantation. It's been interesting to see when certain names started in the family tree. As for partying, I last partied 'til dawn 2 years ago. Most times the party's stop earlier because my friends can't hang as long as I can but I made a commitment two 1/2 years ago to have people over regularly - as individuals, in pairs and as a group - for food, games and music. Fabulous. Someone in one's circle has to be the one to stop the action, the busyness, the doing everything but the things that matter and get people to just hangout. What a fascinating story. To get a party together like that would have been such an undertaking in 1909. You couldn't just call people up. Everything would have had to have been planned by word of mouth and whatever mail system there was constructed at the time. How cool would that be. @ Good and Plenty - wow, that sounds fascinating. I hope you blog about it soon. And good to see you are the one instigating all the great social events. @ SHST - You are right because they lived in the country too. I guess the word spread by horseback or whatever. They were all farming families mainly but the thing that gets me is they surprise each other like that. I would have died!! Really great post. All of my grandparents are gone and I miss the stories that I took for granted all those years. Sadly, my parents do not like to tell stories of their childhood. I did recieve the old pictures when the grandparents died, so as least I have that history. Come over to New Orleans and we'll party in the Cemetery! Lol. I think it's wonderful that you enjoyed the history of your family. Sounds like some interesting stories to share! The invitation is open ~ just knock on the door and we'll be there! @ Kaye, oh thanks for dropping by. @ alta - how great would that be. I dream about a world blogging tour. This is a terrific post, I enjoyed reading it very much. It is always interesting to read about ones past, finding out what made the ancestors tick. You are right, most of them had less but they enjoyed what they had, it seems families were closer then. Now a days we get so involved with our own lives, life moves on and we do not keep in touch like we should with relatives. Hope you have a nice weekend. Thanks Margaret, I agree we should all socialise a lot more with people who matter most to us.